The BBC is inviting viewers to join the world's biggest online climate prediction project. Climateprediction.net has already been running for two years and has generated forecasts on the likely extent of climate change. 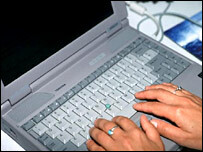 Participants download software onto their personal computers which run the program when the machine is idle. Its newest, most sophisticated computer model is being launched on Tuesday in conjunction with BBC Four in the UK. "The main change in this model is that it uses a fully dynamic ocean," said the project's chief scientist David Stainforth from Oxford University. "Previous versions used a very simplified ocean, whereas this one allows us to see how the atmosphere and the ocean interact," he told the BBC News website. The upgraded design should provide a more accurate representation of the real world, where heat and gases are continuously exchanged between the atmosphere and the ocean, and should produce more realistic projections of future climate. 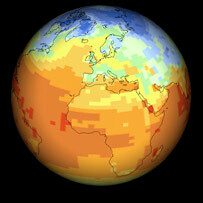 Climateprediction.net is funded by the Natural Environment Research Council. It was established more than two years ago and uses the "distributed computing" approach. Rather than running programs on one supercomputer, it uses the combined power of numerous PCs, each running a slightly different computer simulation. No two simulations produce exactly the same results; overall, the project produces a picture of the possible range of outcomes given the present state of scientific knowledge. Last year, climateprediction.net released results from its existing model suggesting that a doubling of the atmospheric concentration of carbon dioxide would increase the global average temperature by between 2C and 11C. Distributed computing has been used before, notably by the Search for Extra-Terrestrial Intelligence, or Seti, where several million people have downloaded software enabling them to analyse data from observations of distant stars for signs of alien life. The scientists behind climateprediction.net believe their project is also a tool to spread awareness and understanding of climate change. The link to BBC television may, they believe, help with this angle of their project as well as recruiting more users. They hope to have initial results from the new model about three months after it is launched. Frances McNamara, the BBC's producer for the experiment, said the project would give people a chance to be part of efforts to tackle a warming world. "We wanted to use the BBC's web and interactive services to help the audience to make a personal contribution - not only to the climate change season of programming, but also to genuinely new science." At the end of the BBC Four programme Meltdown, viewers will be asked to log in, download, and set their PCs to the task of predicting the climate of the future. Meltdown, part of the Climate Chaos Season, will be broadcast on BBC Four on Monday 20 February 2006 at 21:00GMT.